Pembrolizumab (formerly MK-3475 and lambrolizumab, trade name Keytruda)  is a humanized antibody used in cancer immunotherapy. It is an IgG4 isotype antibody that blocks a protective mechanism of cancer cells and thereby, allows the immune system to destroy them. It targets the programmed cell death protein 1 (PD-1) receptor of lymphocytes. The FDA initially approved it to treat metastatic melanoma. In 2017 the FDA approved it for any unresectable or metastatic solid tumor with certain genetic anomalies (mismatch repair deficiency or microsatellite instability). This was the first time the FDA approved a cancer drug based on tumor genetics rather than tissue type or tumor site, therefore, Pembrolizumab is a so-called tissue-agnostic drug. 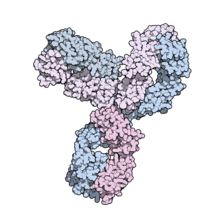 Humanized antibodies are antibodies from non-human species whose protein sequences have been modified to increase their similarity to antibody variants produced naturally in humans. 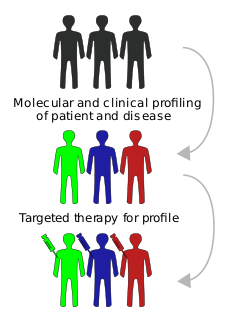 The process of "humanization" is usually applied to monoclonal antibodies developed for administration to humans. Humanization can be necessary when the process of developing a specific antibody involves generation in a non-human immune system. The protein sequences of antibodies produced in this way are partially distinct from homologous antibodies occurring naturally in humans, and are therefore potentially immunogenic when administered to human patients. There are other types of antibodies developed. The International Nonproprietary Names of humanized antibodies end in -zumab, as in omalizumab. Cancer immunotherapy is the artificial stimulation of the immune system to treat cancer, improving on the system's natural ability to fight cancer. It is an application of the fundamental research of cancer immunology and a growing subspecialty of oncology. It exploits the fact that cancer cells often have tumor antigens, molecules on their surface that can be detected by the antibody proteins of the immune system, binding to them. The tumor antigens are often proteins or other macromolecules. Normal antibodies bind to external pathogens, but the modified immunotherapy antibodies bind to the tumor antigens marking and identifying the cancer cells for the immune system to inhibit or kill. Programmed cell death protein 1, also known as PD-1 and CD279, is a protein on the surface of cells that has a role in regulating the immune system's response to the cells of the human body by down-regulating the immune system and promoting self-tolerance by suppressing T cell inflammatory activity. This prevents autoimmune diseases, but it can also prevent the immune system from killing cancer cells. Platinum-based antineoplastic drugs are chemotherapeutic agents used to treat cancer. They are coordination complexes of platinum. These drugs are used to treat almost half of people receiving chemotherapy for cancer. In this form of chemotherapy, popular drugs include cisplatin, oxaliplatin, and carboplatin, but several have been proposed or are under development. Addition of platinum-based chemotherapy drugs to chemoradiation in women with early cervical cancer seems to improve survival and reduce risk of recurrence. Programmed death-ligand 1 (PD-L1) also known as cluster of differentiation 274 (CD274) or B7 homolog 1 (B7-H1) is a protein that in humans is encoded by the CD274 gene. Mismatch repair cancer syndrome (MMRCS) is a cancer syndrome associated with biallelic DNA mismatch repair mutations. It is also known as Turcot syndrome and by several other names. Immune tolerance in pregnancy or maternal immune tolerance is the immune tolerance shown towards the fetus and placenta during pregnancy. This tolerance counters the immune response that would normally result in the rejection of something foreign in the body, as can happen in cases of spontaneous abortion. It is studied within the field of reproductive immunology. In June 2018, the FDA approved pembrolizumab for use in both advanced cervical cancer for PD-L1 positive patients  and for the treatment of adult and pediatric patients with refractory primary mediastinal large B-cell lymphoma (PMBCL), or who have relapsed after two or more prior lines of therapy  . Transitional cell carcinoma, also urothelial carcinoma, is a type of cancer that typically occurs in the urinary system. It is the most common type of bladder cancer and cancer of the ureter, urethra, and urachus. It is the second most common type of kidney cancer, but accounts for only five to 10 percent of all primary renal malignant tumors. Ipilimumab is a monoclonal antibody that works to activate the immune system by targeting CTLA-4, a protein receptor that downregulates the immune system. Tremelimumab is a fully human monoclonal antibody against CTLA-4. It is an immune checkpoint blocker. Previously in development by Pfizer, it is now in investigation by MedImmune, a wholly owned subsidiary of AstraZeneca. It has been undergoing human trials for the treatment of various cancers but has not attained approval for any. Oncolytics Biotech Inc. is a Canadian company headquartered in Calgary, Alberta, that is developing an intravenously delivered immuno-oncolytic virus called REOLYSIN® for the treatment of solid tumors and hematological malignancies. REOLYSIN is a non-pathogenic, proprietary isolate of the unmodified reovirus that: induces selective tumor lysis and promotes an inflamed tumor phenotype through innate and adaptive immune responses. REOLYSIN®, is a proprietary isolate of the unmodified human reovirus (reovirus) being developed as a first-in-class systemically administered immuno-oncology viral agent for the treatment of solid tumors and hematological malignancies. REOLYSIN is classified as an oncolytic virus, a virus that preferentially lyses cancer cells. Based on both single-arm and randomized phase 2 clinical studies, REOLYSIN also promotes an inflamed tumor phenotype through innate and adaptive immune responses. Clinical trials have demonstrated that REOLYSIN may have activity across a variety of cancer types when administered alone and in combination with other cancer therapies. Nivolumab, marketed as Opdivo, is a medication used to treat cancer. It is used as a first line treatment for inoperable or metastatic melanoma in combination with ipilimumab if the cancer does not have a mutation in BRAF, as a second-line treatment following treatment with ipilimumab and if the cancer has a mutation in BRAF, with a BRAF inhibitor, as a second-line treatment for squamous non-small cell lung cancer, and as a second-line treatment for renal cell carcinoma. Nivolumab has recently been approved for small cell lung cancer. Sonidegib is a Hedgehog signaling pathway inhibitor being developed as an anticancer agent by Novartis. Durvalumab is an FDA-approved immunotherapy for cancer, developed by Medimmune/AstraZeneca. It is a human immunoglobulin G1 kappa (IgG1κ) monoclonal antibody that blocks the interaction of programmed cell death ligand 1 (PD-L1) with the PD-1 and CD80 (B7.1) molecules. Durvalumab is approved for the treatment of patients with locally advanced or metastatic urothelial carcinoma who either have disease progression during or following platinum-containing chemotherapy or have disease progression within 12 months of neoadjuvant or adjuvant treatment with platinum-containing chemotherapy. Avelumab is a fully human monoclonal antibody developed by Merck KGaA and Pfizer as a pharmaceutical drug for use in immunotherapy, originally for the treatment of non-small-cell lung carcinoma (NSCLC). 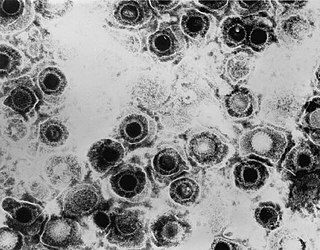 Viralytics Ltd is an Australian biotechnology company working in the field of oncolytic viruses, that is, viruses that preferentially infect and kill cancer cells. The company's oncolytic virus product, called Cavatak, is currently in clinical trials in metastatic melanoma and other cancers. The drug was granted Orphan Drug status in advanced melanoma in December 2005. PD-1 inhibitors and PD-L1 inhibitors are a group of checkpoint inhibitors being developed for the treatment of cancer. PD-1 and PD-L1 are both proteins present on the surface of cells. Immune checkpoint inhibitors such as these are emerging as a front-line treatment for several types of cancer. Cemiplimab (REGN-2810) is a monoclonal antibody under development as a drug for the treatment of squamous cell skin cancer, myeloma, and lung cancer. This article incorporates public domain material from the United States Department of Health and Human Services document "FDA D.I.S.C.O. : First Tissue/Site Agnostic Approval Transcript" by Sanjeeve Bala.Retrieved on 2017-06-17. ↑ "Pembrolizumab". AdisInsight. Retrieved 5 November 2016. 1 2 Syn, Nicholas L; Teng, Michele W L; Mok, Tony S K; Soo, Ross A (2017). "De-novo and acquired resistance to immune checkpoint targeting". The Lancet Oncology. 18 (12): e731–e741. doi:10.1016/s1470-2045(17)30607-1. 1 2 3 4 5 6 7 8 9 10 "Pembrolizumab label at eMC". UK Electronic Medicines Compendium. 27 January 2017. ↑ Redman, Jason M.; Gibney, Geoffrey T.; Atkins, Michael B. (6 February 2016). "Advances in immunotherapy for melanoma". BMC Medicine. 14 (1). doi:10.1186/s12916-016-0571-0. PMC 4744430 . PMID 26850630. ↑ Fuereder, Thorsten (20 June 2016). "Immunotherapy for head and neck squamous cell carcinoma". memo - Magazine of European Medical Oncology. 9 (2): 66–69. doi:10.1007/s12254-016-0270-8. PMC 4923082 . PMID 27429658. 1 2 3 4 5 6 Syn, Nicholas L; Teng, Michele W L; Mok, Tony S K; Soo, Ross A (2017). "De-novo and acquired resistance to immune checkpoint targeting". The Lancet Oncology. 18 (12): e731–e741. doi:10.1016/s1470-2045(17)30607-1. ↑ Chen, Hongbin; Vachhani, Pankit (September 2016). "Spotlight on pembrolizumab in non-small cell lung cancer: the evidence to date". OncoTargets and Therapy. 9: 5855–5866. doi:10.2147/ott.s97746. PMC 5045223 . PMID 27713639. 1 2 "FDA grants accelerated approval to pembrolizumab for first tissue/site agnostic indication". Food and Drug Administration. May 23, 2017. ↑ Linardou, Helena; Gogas, Helen (July 2016). "Toxicity management of immunotherapy for patients with metastatic melanoma". Annals of Translational Medicine. 4 (14): 272–272. doi:10.21037/atm.2016.07.10. PMC 4971373 . PMID 27563659. 1 2 Francisco LM, Sage PT, Sharpe AH (Jul 2010). "The PD-1 pathway in tolerance and autoimmunity". Immunological Reviews. 236: 219–42. doi:10.1111/j.1600-065X.2010.00923.x. PMC 2919275 . PMID 20636820. 1 2 Buqué, Aitziber; et al. (2 March 2015). "Trial Watch: Immunomodulatory monoclonal antibodies for oncological indications". OncoImmunology. 4 (4): e1008814. doi:10.1080/2162402x.2015.1008814. PMC 4485728 . PMID 26137403. ↑ Pardoll, DM (Mar 22, 2012). "The blockade of immune checkpoints in cancer immunotherapy". Nature Reviews Cancer. 12 (4): 252–64. doi:10.1038/nrc3239. PMC 4856023 . PMID 22437870. 1 2 3 Bala, Sanjeeve; Nair, Abhi (30 May 2017). "Approved Drugs - FDA D.I.S.C.O. : First Tissue/Site Agnostic Approval Transcript". FDA. 1 2 "Statement on a Nonproprietary Name Adopted by the USAN Council" (PDF). November 27, 2013. ↑ "Assessment report: Keytruda. Procedure No. EMEA/H/C/003820/0000" (PDF). EMA. 21 May 2015. ↑ "Unlocking Checkpoint Inhibition". Translational Scientist. August 9, 2016. ↑ "Inventors of the Year". Inventors Digest. Retrieved 8 May 2017. 1 2 3 4 5 6 7 Shaywitz, David (July 26, 2017). "The Startling History Behind Merck's New Cancer Blockbuster". Forbes. ↑ Hamid, O; et al. (2013). "Safety and tumor responses with lambrolizumab (anti-PD-1) in melanoma". New England Journal of Medicine. 369 (2): 134–44. doi:10.1056/nejmoa1305133. PMC 4126516 . PMID 23724846. ↑ U.S. Food and Drug Administration (September 4, 2014). "FDA approves Keytruda for advanced melanoma". U.S. Food and Drug Administration. U.S. Food and Drug Administration. Retrieved 24 December 2015. ↑ "FDA Approves Anti-PD-1 Drug for Advanced Melanoma". cancernetwork.com. ↑ Pollack, Andrew (May 29, 2015). "New Class of Drugs Shows More Promise in Treating Cancer". New York Times . Retrieved May 30, 2015. ↑ "Merck & Co and Taiho to co-promote cancer immunotherapy pembrolizumab in Japan". The Pharma Letter. April 13, 2016. ↑ "Keytruda index page at EMA". European Medicines Agency. Retrieved 10 November 2016. ↑ "FDA approves Keytruda for advanced non-small cell lung cancer". U.S. Food and Drug Administration. October 2, 2015. ↑ Ledford, Heidi (24 May 2017). "News: Tissue-independent cancer drug gets fast-track approval from US regulator". Nature. doi:10.1038/nature.2017.22054. ↑ "Accelerated approval notice: BLA 125514/S-14" (PDF). FDA. 23 May 2017. ↑ "FDA Approves Pembrolizumab for Advanced Cervical Cancer with Disease Progression During or After Chemotherapy". ASCO. 2018-06-12. Retrieved 2018-06-13. ↑ Research, Center for Drug Evaluation and. "Approved Drugs - FDA approves pembrolizumab for treatment of relapsed or refractory PMBCL". www.fda.gov. Retrieved 2018-06-16. ↑ Timmerman, Luke (June 2, 2015). "ASCO Wrapup: Immunotherapy Shines, Hope For Brain Tumors, & The Great Cancer Drug Price Debate". Forbes. ↑ Adams, Katherine T. (24 July 2015). "Cancer Immunotherapies--and Their Cost--Take Center Stage at ASCO's 2015 Annual Meeting". Managed Care Magazine Online. ↑ Jenkins, Kristin (5 May 2016). "Keytruda Impresses in Triple-Negative Breast Cancer". MedPage Today. ↑ "Merck & Co updates Keytruda findings at ASCO". The Pharma Letter. June 10, 2016. ↑ Nghiem (2016). "PD-1 Blockade with Pembrolizumab in Advanced Merkel-Cell Carcinoma". N. Engl. J. Med. 374 (26): 2542–2552. doi:10.1056/NEJMoa1603702. PMC 4927341 . PMID 27093365. ↑ Le, DT; Durham, JN; Smith, KN; Wang, H; Bartlett, BR; Aulakh, LK; Lu, S; Kemberling, H; Wilt, C; Luber, BS; Wong, F; Azad, NS; Rucki, AA; Laheru, D; Donehower, R; Zaheer, A; Fisher, GA; Crocenzi, TS; Lee, JJ; Greten, TF; Duffy, AG; Ciombor, KK; Eyring, AD; Lam, BH; Joe, A; Kang, SP; Holdhoff, M; Danilova, L; Cope, L; Meyer, C; Zhou, S; Goldberg, RM; Armstrong, DK; Bever, KM; Fader, AN; Taube, J; Housseau, F; Spetzler, D; Xiao, N; Pardoll, DM; Papadopoulos, N; Kinzler, KW; Eshleman, JR; Vogelstein, B; Anders, RA; Diaz LA, Jr (8 June 2017). "Mismatch-repair deficiency predicts response of solid tumors to PD-1 blockade". Science. 357: 409–413. doi:10.1126/science.aan6733. PMC 5576142 . PMID 28596308.